OF YOUR STOCK PICKING ABILITIES! True ownership of one share of Worldcom stock framed like you want. The recipient becomes a real shareholder of the company. 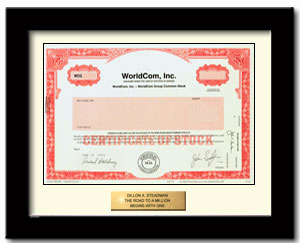 You can still own a WorldCom collectible stock certificate. Please note shares are NOT registered in your name because of the WorldCom bankruptcy. The certificates are collectibles registered in our company name. The Worldcom stock certificate is strikingly ornate. It represents a snapshot of history incorporating the company's name, logo, corporate seal, and printed signatures of corporate officers. Get yours while you can because in the not too distant future, the industry will eliminate physical stock certificates making these valuable collectibles. IMPORTANT: Shares are NOT registered in your name. Because of the WorldCom bankruptcy, shares are no longer traded. We have a limited number of authentic WorldCom stock certificates registered in our company name - They are REAL one-share certificates that are no longer being traded and are a snapshot of the largest bankruptcy in world history and the corporate corruption of the 1990s.